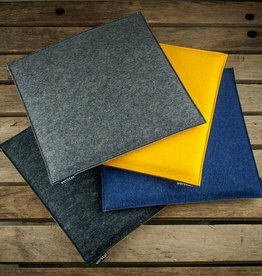 Felt seat cushions are beautiful, soft and above all comfortable. Seat cushions, chair cushions, bench cushions, made of wool felt, look good and feel wonderful. 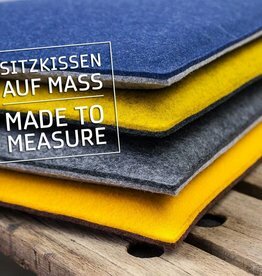 We use 3 mm wool felt for the bottom and top and in between we pack 20 mm foam for relaxed sitting. 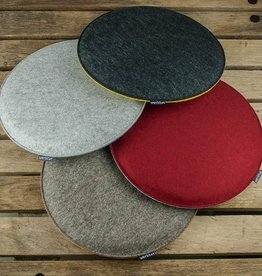 The seat cushions made of pure wool felt absorb moisture, dry quickly and insulate against heat and cold. The felt cushions can be used on both sides. Optionally, the seat cushions can be provided with natural latex on the underside. The latex is applied by hand and lasts better and longer than commercially available anti-slip coatings. Our felt seat cushions are manufactured completely according to your wishes. After you have decided on the format (round, square or made to measure), choose one of our sizes. Now you still have countless options how you can design the cushions in colour: Choose from our modern colours the felt for top and bottom and decide whether you need the anti-slip coating for your felt seat cushions. After your order, the felt cover and foam are cut and then sewn. The felt seat cushions can be a real patent recipe when it comes to refreshing the living space. They belong not only on the chair in the dining room or on the stove bench in the tiled stove, but also on the stool in the hallway. They enhance the simplest furnishings and make them comfortable and modern. Felt seat cushions from werktat bring simple comfort to every area of the house. The colourful felt seat cushions perfectly match your furnishings and become an inviting eye-catcher. Due to our unique selection possibilities, they fit harmoniously into your apartment, no matter if minimalist or rustic designed living rooms. Bench covers and cushions for benches can be ordered directly online from werktat in your furniture size. We offer felt cushions with free size specification up to 2.10 m length and 0.8 m width. You can also equip unusual furniture seating areas with comfortably upholstered, tailor-made wool felt cushions.